Abstract: Gastric adenocarcinoma and proximal polyposis of the stomach (GAPPS) is a recently described, rare gastric polyposis syndrome. It is characterized by extensive involvement of the fundus and body of the stomach with fundic gland polyps sparing the antrum and lesser curvature, an autosomal dominant inheritance pattern with incomplete penetrance, and a significant predisposition for the development of gastric adenocarcinoma. Due to the recent discovery of APC promotor IB mutations (c.-191T>C, c.-192A>G, and c.-195A>C), which reduce binding of the transcription factor Yin Yang 1 (YY1) and transcriptional activity of the promotor, as its underlying genetic perturbation, GAPPS has been added to the growing molecular class of APC-associated disorders. 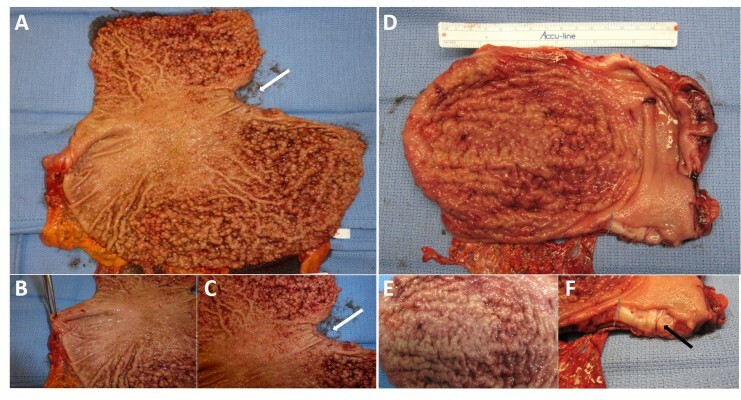 Recent reports on family members afflicted by gastric polyposis due to GAPPS have described the development of metastatic cancer or the presence of invasive gastric adenocarcinoma in total gastrectomy specimens after variable periods of endoscopic surveillance emphasizing the need for an improved understanding of the to-date poorly characterized natural history of the syndrome. There are, however, currently no guidelines on screening, timing of prophylactic gastrectomy, or endoscopic surveillance for GAPPS available. In this review, we summarize the clinical, pathological, and genetic aspects of GAPPS as well as management approaches to this rare cancer predisposition syndrome, highlighting the need for early recognition, a multidisciplinary approach, and the creation of prospective family registries and consensus guidelines in the near future.